(NaturalNews) When Ron and Nadine from the Living Libations beauty care and chocolate company (www.LivingLibations.com) attempted to fly to the United States in August of this year, they ran into something completely unexpected: Drug-sniffing dogs at the Toronto airport. When their dogs took a special interest in their raw, unrefined chocolate with hemp seeds and superfood extracts, they were arrested, handcuffed and put through hours of tortuous interrogation. Such begins the journey of Ron and Nadine, the chocolate freedom fighters from Canada. Accused of trafficking two and a half pounds of hashish (which was really just raw, homemade chocolate), Ron and Nadine were arrested, physically separated into interrogation rooms and handcuffed to chairs. Their six-month old baby was forcibly taken from them, and they were immediately subjected to intense interrogation. Their chocolate looked suspicious, they were told, because it wasn't in a commercial wrapper. If it's not Hershey's, it must be drugs! 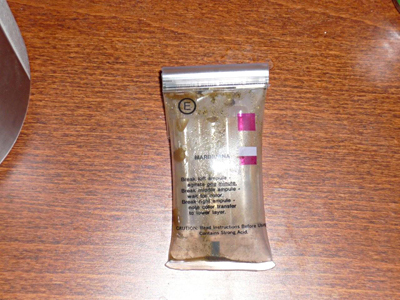 An on-the-spot drug test from the NIK company (which makes portable drug testing kits) returned a positive result, the Canadian police claimed, and that's all the evidence they need to arrest anyone. 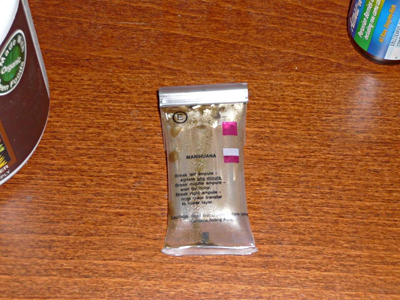 As you'll learn later, however, it turns out the NIK drug testing kits return false positives nearly 100% of the time if the results are interpreted incorrectly, as they were in this case... (see photos below). Is this Canada, or Gitmo? Emboldened by the positive drug test on the two pounds of raw chocolate, Canadian drug agents scrambled to action. They hadn't seen a big drug bust in a long time, and excitement was brewing over the possibility of nabbing someone with a whopping two pounds of hashish! Thus, the tyrants of law enforcement went to work on Ron and Nadine, using Guantanamo Bay tactics to try to force them to admit to being hashish drug traffickers. Through the entire episode, Ron and Nadine resisted the tactics, held their ground and continued to hold positive intentions. 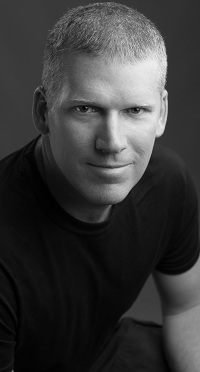 "As I was sitting in the cell," Ron told NaturalNews, "I kept focused on light and truth. I felt like no matter what was happening around me, I was opening up a gateway of light and total truth." After the interrogation, the threats of "life in jail" and other dishonest tactics used by law enforcement to try to get them to "admit" to drug trafficking, they were finally released on bail. Their baby son was returned to them, and they went home. For the next 30 days, they were subjected to surprise visits by Children's Aid employees (the Canadian version of Child Protective Services), who were told by law enforcement authorities that Ron and Nadine were drug smugglers. Over this 30 day period, as felony drug trafficking charges were pending against them, Ron and Nadine managed to connect with legal help. Their lawyer, Marcy Segal, was able to persuade the Crown Attorney to send the chocolate "hashish" sample to a proper lab for testing. And wouldn't you know it: The test showed that chocolate is chocolate, not hashish. The charges were dropped, but no apology was ever offered to the couple. Instead, Canadian law enforcement authorities declared, "You must have been smoking something before you came to the airport." Following their being cleared by the lab tests, they were determined to return to the United States and attend the Raw Spirit Festival in Sedona Arizona. Their lawyer had contacted U.S. authorities in advance, advising them that Ron and Nadine were bringing chocolate through their security checkpoints as they crossed from Canada to the United States. "Watch out, it's chocolate!" They were told everything was understood, and the chocolate would be allowed through. Imagine their surprise, however, when Ron and Nadine were once against arrested at the airport and accused of -- guess what? -- smuggling hashish disguised as chocolate! U.S. law enforcement authorities boost their careers when they take part in big drug busts, and 2.5 pounds of hashish was a huge bust by anyone's accounting. So they had every incentive to try to make this bust stick. Desperate to prove themselves right, the American drug enforcement police ripped though Ron and Nadine's luggage and clothing, opening every vial, asking questions about all the "strange" things they found there. What kind of strange things? Sea salt. Zeolites. Tea tree oil. Essential oils. Hemp seeds. Probiotics. Raw cacao nibs. You know, dangerous superfoods and supplements. The field kit drug tests produce false positives! So why did the NIK drug test reveal a positive result when the cacao was tested? 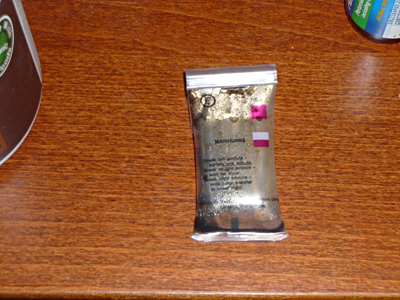 To answer that question, NaturalNews purchased a portable narcotics drug test kit from CopQuest.com, an online supply source for law enforcement. The product we purchased is the Narcotics Identification System, part # 6060. It is manufactured by NIK Public Safety, Inc. in Jacksonville, FL. The test we used is test "E" -- which claims to offer "presumptive identifications of Marijuana, Hashish, Hash Oil and THC." "5. Break middle ampoule and agitate gently. A blue-violet (or purple) color will develop within a few seconds to a minute if Marijuana, Hashish, Hash Oil or THC is present. Allow sufficient time for the blue-violet (or purple) to develop for a positive test." Here at NaturalNews, we decided to put it to our own test. 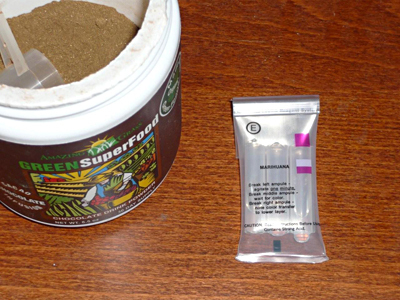 To test this NIK marijuana kit, I went to my kitchen and grabbed some Amazing Grass Chocolate Superfood (AmazingGrass.com). I thought, if we're testing for grass, why not test amazing grass? 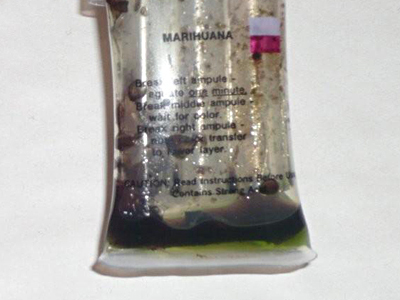 Now, remember that the test kit says, "A blue-violet (or purple) color will develop within a few seconds to a minute if Marijuana, Hashish, Hash Oil or THC is present. Allow sufficient time for the blue-violet (or purple) to develop for a positive test." If this test had been conducted at the border, I could have been arrested, handcuffed to a chair in a jail cell, and subjected to ten hours of interrogation. That's all it takes, folks: Just one person shaking this plastic test kit and believing he sees a "purple" or "bluish" color. And this is the test the border police are using to arrest raw foodies and charge them with felony crimes! Anything they don't recognize gets put to the NIK test, and just about everything I've found produces a similar result. Here's another important point: Color is a SUBJECTIVE thing. One person might say it's dark blue, another could say it's brown, and a third could say it's purple. All it takes is one crack-smoking idiot with a badge to utter the word, "purple" and suddenly you're arrested at gunpoint, thrown into a jail cell and interrogated for ten hours. Welcome to the USA! It is the belief of NaturalNews that the NIK Narcotics Identification products produce false positives or, at the very least, misleading results that are frequently misinterpreted by law enforcement authorities as positives. It is important to note that NIK tests carry zero weight in a court of law. But they have the power to arrest, and law enforcement authorities are now openly abusing that power, using these "false positive" to arrest and detain anyone they wish to target (such as raw foodies). After being charged with felony crimes, accused of trafficking illegal drugs, interrogated, isolated from his family and denied the right to travel as a free citizen, Ron Obadia is now facing over $22,000 in legal bills. Even after the real drug test conclusively proved there were NO drugs in the raw chocolate, there was no apology from Canadian law enforcement officials. No offer to reimburse Ron and Nadine for their legal expenses. They were simply let go and told to go home. Charges are still pending from the American side (they were about to board an international flight), and it may require another $10,000 in legal bills just to clear their names in America. As a result, Ron and Nadine are virtual prisoners in their own country. Accused of crimes they did not commit, these raw foodies only committed the "crime" of daring to carry real food that wasn't packaged in a brand-name wrapper. At one point, one of the police officers screamed at Ron, saying, "If you wanted chocolate, why didn't you just buy a Snickers bar!" The proper answer to that question, of course, is so far beyond the intellect of typical law enforcement personnel that I won't even bother explaining it here. To these cops, Burger King is fine cuisine, candy bars are superfoods and hashish is anything that looks brown and unusual. Ran and Nadine were never able to attend the Raw Spirit Festival. They spent the day being interrogated for crimes they did not commit. Ron and Nadine desperately need your support to not just pay off their legal bills, but to sue Canadian law enforcement officials for false arrest. We need to raise $50,000 in order for this to be pursued. It's an important mission, and if successful, it could send a message to border agents everywhere to keep their hands off the chocolate! It doesn't actually contain hashish, by the way. It's made from wholesome superfoods and delicious, raw ingredients! They also carry some outstanding beauty products made with high-grade essential oils and all-natural ingredients. Check it out. The next thing you can do is help get Ron and Nadine's story out to the world! If you're an author, website owner or radio show host, contact them for an interview, and help them get the word out about this tyrannical attack on raw foods by ignorant law enforcement personnel. You also have permission to copy and post this story everywhere. Simply give credit to NaturalNews for this investigative story, and you can openly post it on your website, use it in your book, quote it in a documentary, newspaper or magazine. The third way you can help is to directly donate money to Ron and Nadine. To help provide publicity to those individuals or companies willing to support Ron and Nadine, NaturalNews will publish a follow-up article listing the names, websites and donation amounts of all individuals and companies donating $1,000 or more. I'm willing to bet Nutiva will likely be on that list, and perhaps even Ruth's Hemp Foods from Canada. Get the word out, and ask companies for generous donations. We need to help protect our natural foods community from police state tactics. What Ron and Nadine experienced here is just one symptom of a War on Drugs that's utterly out of control. While completely ignoring the real drug dealers (Big Pharma and psychiatrists who put kids on amphetamines), tyrannical law enforcement personnel target innocent natural health advocates who refuse to eat Snickers bars and Big Macs. Carrying "unusual" food with you at the airport is now a crime that can get you thrown in jail and cost you $20,000 or more in legal bills. And that's when you're innocent! The War on Drugs has done virtually nothing to stem the tide of illegal street drugs, but it's sure given lots of money and power to another group: The DEA and other drug enforcement tyrants whose careers (and paychecks) depend on continuing their politically-motivated crusade against innocents. The real point to all of this, of course, is not to stop Americans from using drugs; it's to force Americans to use patented drugs that earn profits for powerful corporations. The job of the DEA is primarily to eliminate Big Pharma's competition by criminalizing non-patented drugs while protecting patented ones. In order to concentrate power into their own hands, they must create fear and terrorize the population, which is why the DEA keeps raiding California medical marijuana clinics, by the way... even though they are legal in the State of California! The real criminals in society today are not the lazy pot heads toking up a joint in the basement. The real criminals are those who terrorize us, take away our freedoms and steal our money while bailing out the rich. And guess who does all three? Your government, of course! Ron and Nadine are unwittingly playing a Ghandi-like role in this grand governmental comedy. By perservering their arrest and interrogation and proving their obvious innocence in the face of outrageous stupidity, they bring focus to the idiocy of modern law enforcement and the real threat posed to innocents by our nation's ill-fated War on Drugs. Real power comes from health and wisdom, and yet the people running our governments today have neither; so they must fabricate false power through the use of firearms, fear and intimidation. These are the weapons of the weak, and they will ultimately fall to the strength and courage of enlightened, health-infused individuals like Ron and Nadine from Living Libations. Because when this whole grand house of cards comes crashing down, with systemic financial collapse, crop failures, water depletion, and infectious disease, all those parasitic employees of the federal government are going to find themselves utterly incapable of surviving in the real world. Without their diabetes meds, diet sodas and processed junk foods, they will quickly find themselves irrelevant to life on Earth, swept under the carpet of life like the dust from which they came. Those who are too stupid to recognize real food are ultimately doomed to become food. For the worms, that is. "The Birth of Big Pharma"